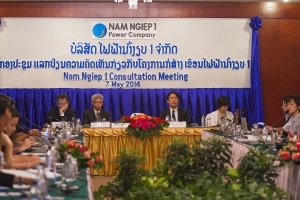 The Nam Ngiep 1 Power Company (NNP1), a partnership between KPIC Netherlands (45%), a subsidiary of Japan’s Kansai Electric Power, EGAT International (30%) of Thailand, and the Lao Holding State Enterprise (25%). The company was formed to develop the Nam Ngiep 1 Project after the Lao government requested Japanese assistance in setting up a plant to harness the power potential of the Ngiep River. The company has its headquarters in the Lao capital, Vientiane, plus field offices in Pakxan and at the main construction camp in Bolikhamxay province. Small offices are also maintained in project area villages in Xaysomboun province. NNP1 employs engineers, administrative professionals, and social and environmental experts. Most staff are recruited locally in the Lao PDR with some seconded from the shareholders. Company operations and targets are defined by a Concession Agreement with the Lao Government, which has granted a 27-year operating and ownership period to Nam Ngiep 1 Power to run the project following completion of construction. NNP1 is dedicated to building an efficient, durable and environmentally-friendly power plant that will assist with national development and also help local people in the project area improve their livelihoods.